← £60 million search begins for the next media hit after Peppa Pig, Art Attack and Desert Island Discs – Might it be ‘Conservation’? 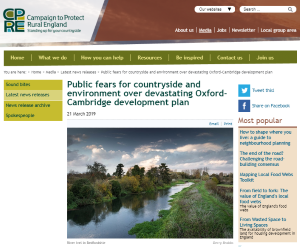 Three-quarters (74%) of residents living on a corridor between Oxford and Cambridge believe that plans for major new development across the region will lead to damage of the local countryside and environment, according to new public polling published on 21 March by the Campaign to Protect Rural England (CPRE). The poll, which was carried out by research company Survation on the behalf of the countryside charity, interviewed 1,500 residents across five counties (Oxfordshire, Buckinghamshire, Northamptonshire, Bedfordshire and Cambridgeshire) on development proposals known as the Oxford-Cambridge Arc. The plans could see one million new homes built across the region by 2050. A CPRE analysis from last year demonstrated that in order to build the one million new houses, an area of countryside greater than the size of Birmingham would be lost to development. Despite the scale of the development, the government has given the project its backing without a formal public consultation, or weighing up its impact on the countryside, people’s health, and climate change. Despite this, CPRE warn that based on current projections, no more than 18% of the locally identified need for affordable homes will be met during the planned period of growth. Without a formal public consultation and an environmental assessment, the impact of the government’s ‘growth at all costs’ approach could have catastrophic consequences for the local countryside, wildlife and environment, to the detriment of local communities.